You manage hotel Reputation..We manage hotel Inventory! Time to grow together now. Selling hospitality technology solutions sets up streams of continual incomes as well as partnership discounts. Your clients would be happy to use total solutions you provide. Happier clients lead to lower attrition. Extensive products and services attract high sales. You get to serve diversified clientele. Covering up wider market. eZee solutions have built in features to help hoteliers stay connected with guests and even collect feedback. We provide mobile apps to hoteliers for operations management. A new sensation you can cash in on! Deliver more than your competitors do and get an edge over them. Gain a bigger market share. 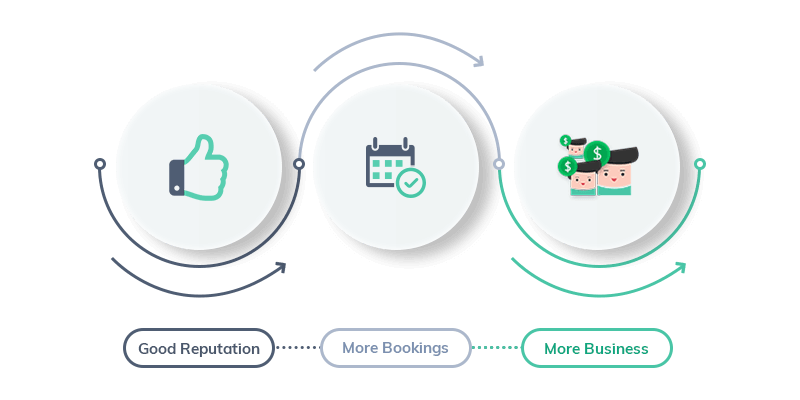 We get hoteliers enrolled on 100+ OTAs, now it’s your turn to manage their reputation there. Combine your Online Reputation Management Software with these hospitality solutions and offer your clients a complete business management package. Get key account manager and all sales/marketing collateral. Get trained and start selling eZee solutions. Your clients are happier with your all inclusive offering. Set up recurring income sources for long term. Get referrals, acquire more business. You get higher ROI and profit. Bingo! Explore eZee’s White label partnership program for more details. Your clients remain yours with eZee’s OEM hospitality solutions leading to enhanced mutual brand value. Let us enter a partnership where your intelligence meets our business.